It all started as a lark. Where do we travel to next? After an exhaustive dart-throwing session on a weathered wall-sized world map, picking Germany as a vacation destination seemed sort of silly. With a 1980 copy of Europe on $10 a Day in hand we trusted the darts. You see, I used to live in Germany. My mother is from Germany. We have family in Germany. We have been to Germany more times than most have been to Disneyland. Bottom line, it’s not really a vacation spot for us. If we go we usually visit family and friends. It’s not a bucket list destination like Machu Picchu or Rio. But, we realized when the rusty bent dart pierced the heart of Dresden, Germany might not be a bad idea as a travel holiday destination. With a 1980 copy of Europe on $10 a Day in hand we trusted the darts. Despite having lived and been to Germany before, there was so much we hadn’t seen — Berlin, Dresden, the migrant tent cities. Speaking of the migrants, allow me to veer off onto a delicate tangent for a moment. Regarding the migrants, I’ve got a plan. The refugee crisis in Europe is a complete tragedy. It is estimated that more than 4 million Syrians are displaced and on the move. It’s the largest refugee crisis since World War II. Let’s not even discuss the irony that they all seem to want to go to Germany. Here’s my humble solution. I call it D.I.P.F.A.R.T., David’s International Plan For Asylum, Really, Today. All European Community countries should have an emergency session to divide the total number of refugees they will accept. Base this on GDP, current population, etc.… For example, Germany gets 250,000, Italy gets 80,000, France gets 150,000, and Hungary gets 15,000. This is only fair and successful countries shouldn’t be overburdened just because they manage their economies well. EU members who refuse should be invited to leave the Union. A subsequent session should be held, preferably later in the day after an espresso but before beers or a nice glass of ’97 Rhone du Vin Beauchamp. During this session EU members should outline the P.A.D., Practical Assimilation Doctrine. The PAD will discuss how long a refugee remains on refugee status in the adoptive country. In other words, how long you get to stay before they cut off the welfare. How long is that, you ask? I don’t know, I’m just the” big idea” guy. But, it should provide detailed instructions on language courses, cultural awareness*, employment training and job search, housing, transportation. Without a detailed plan for all of these things, history will repeat itself and soon these adoptive countries will have its citizens fleeing as refugees due to another war, crisis. There are only two more things for the world to figure out. One, why is it that all of those neighboring Gulf States (Kuwait, Bahrain, Iraq, Oman, Qatar, Saudi Arabia and the United Arab Emirates) have a policy of accepting ZERO Syrian refugees? That’s right, not a one is allowed in. And two, how can an imbecilic rag tag army of 30,000 (ISIS) displace 4 million people with a combined army of 5 million surrounding them in the Gulf States? Doesn’t it seem logical that the refugees would want to remain closer to home, remain with a culture that is their own? Don’t these Arab States think in the long term? Can you imagine the heartfelt thank you notes they would get when this is over? Think outside the box, people. So Germany it is. We Begin in Berlin (alliteration intended). I tried Beginnings in Berlinings but that didn’t work. I tried I Left My Heart in Dresden but that didn’t work. Too soon. I even went so far as to entertain Skippin’ In The Schwartzwald. Nein. We have nine fun-filled days to explore the Germany we’ve never seen. We’ve rented a car. We’ve got a few Air BnB’s lined up. So far the plan is Berlin, Dresden, Rottenburg ob der Tauber, the Black Forest, and Stuttgart. 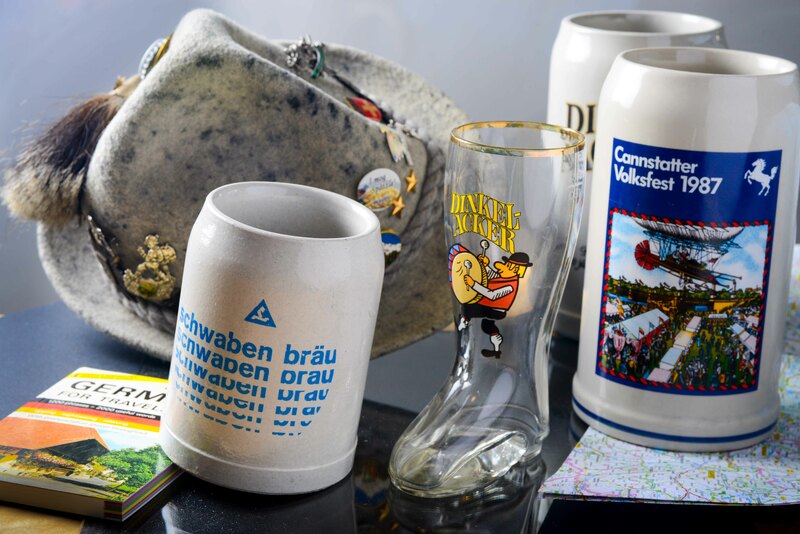 Once in Stuttgart we will visit family and the Volksfest (a concurrent copy of Munich’s Oktoberfest). I have two friends also joining me for the second leg of the Euro Tour. That portion of the tour will undoubtedly cause a mild world crisis in itself. I expect at least one international incident involving mass quantities of beer, schnitzel and Polizei. My friend said “as long as I don’t end up being beheaded on the internet.” I can almost 98.7-percent guarantee that won’t happen. Most of those places don’t have internet anyway. Not to spoil upcoming blogs but after two weeks my beautiful wife must return to California and to work. I am staying an additional two weeks. I mentioned this to two of my bowling league pals, saying “hey, you guys should meet me there.” Much to my surprise they bought tickets and will be meeting me at the Oktoberfest. This little trio plans to visit Stuttgart, Prague, Vienna, Venice and Innsbruck. Ach du Lieber! *Cultural Awareness training might include for all adult males the mandatory donning of Lederhosen and knee-high girly socks on October 1, the subsequent slamming of three one-liter steins of strong room-temperature beer and the forced-feeding of bratwurst by the hands of a big-breasted Valkurian-like woman who yells at you to take it like a man. Posted by pubspeopleplaces on September 23, 2015 in Uncategorized.